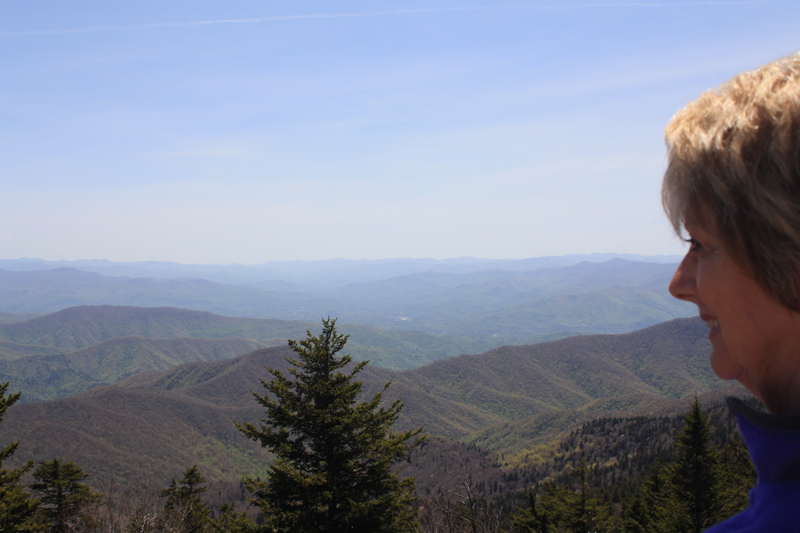 Clingman’s Dome and Cataloochee Valley – Let's Go RVing! Although we got a very late start today we got a lot accomplished. We sort of had directions to Clingman’s Dome and to Cataloochee Valley but quickly decided we really didn’t know where to go so we stopped at the Visitor’s Center in Maggie Valley. We eventually got directions and although we had originally planned to go first to Cataloochee Valley we were advised to go to Clingman’s Dome first as the elk would be coming into Cataloochee Valley late in the afternoon so we headed toward Tennessee. Our first stop was the Great Smoky Mountains Visitor’s Center where we got maps that took us straight to Clingman’s Dome. It’s right off of the Blue Ridge Parkway and then seven miles up on a pretty curvy road. I had incorrectly thought that since it was a week day and still early in the season that there would not be many people there but I was wrong. It wasn’t overly crowded but there were a lot of people there. We had been told at the Great Smoky Mountains Visitor’s Center that the hike up to the dome was much more difficult that the hike up to Waterrock Knob but we disagreed. The path was paved and though steep it wasn’t a difficult climb. There were benches strategically placed so we could rest along the way and we did. 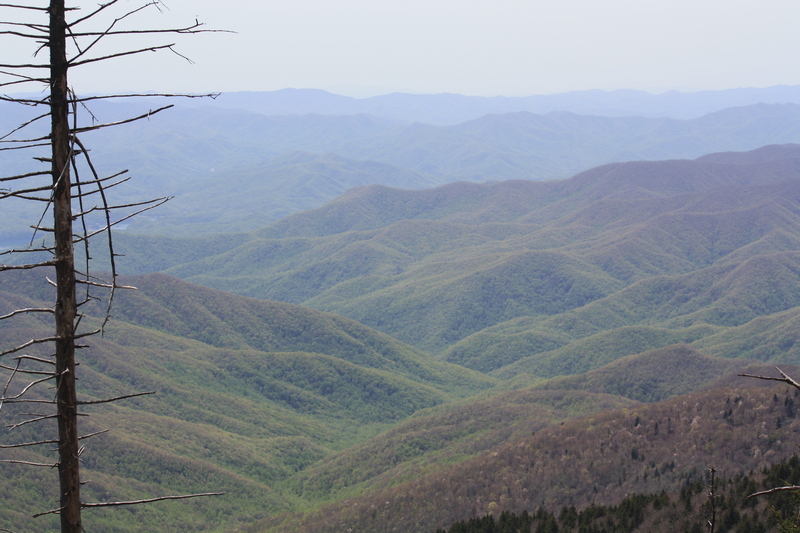 A sign indicated that due to the high altitude we could have trouble breathing and though we were a bit breathless at times it was nothing like we were yesterday when we climbed Waterrock Knob. I have noticed through the week that there are a lot of dead fir trees and today found out that since the 1960’s a tiny insect was accidentally introduced from Europe. The balsam woolly Adelaide has killed over 70% of the park’s mature firs. They feed on tree sap and interfere with the flow of water and nutrients. They can kill a fir within a few years. We saw several people who were hiking the Appalachian Trail. More power to them. I wish I could have done it. No, I don’t. I’m an RVer, not a camper. One of the guys told me that they eat, hike and sleep. That’s a little too rough for me but I do admire the ones that do it. The view from the top of the dome is beautiful. It was very clear today so we could see Pigeon Forge and Gatlinburg. Had we been able to pick out the various mountains we could have easily named them. We were only 11 miles from one of our favorite places, Cade’s Cove. Of course that is probably as the crow flies! After our descent we sat by the car and ate our picnic lunch. Then we headed on back. On the way we stopped by a lovely stream with a pretty bridge indicating hiking trails. Not for us today though. Our next stop was Mingus Mill. Rather than being driven by water it is driven by a small steel turbine. It has a 200 foot long wooden flume that bring the water to the mill’s turbine. You could see that the side of the stream had been recently bolstered. 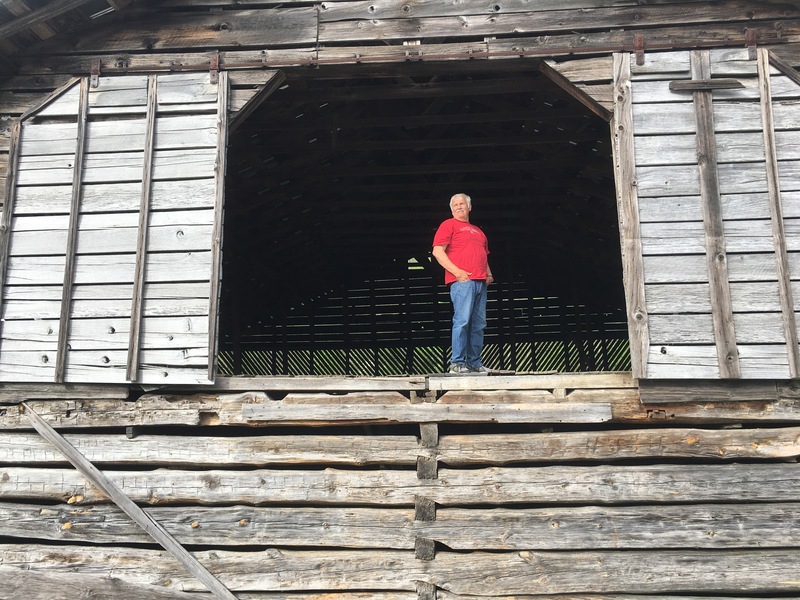 The mill was one of the first buildings restored as a historic structure in the Great Smoky Mountains Park in 1937 and is still maintained today by the park. After leaving the mill we again stopped by the Visitor’s Center so I could buy a magnet! I had seen the magnet earlier but not knowing anything about the mill I elected not to get it then. I did see one with an Elk on it but I haven’t seen an elk yet so didn’t get it. I heard a ranger explain that the nice Visitor’s Center was built and still supported by donor contributions. We stopped for gas and a snack and then headed to Cataloochee Valley. There are several old houses, an old school, an old barn and old church in the valley. We went into the barn. It is amazing to see how well built things of that age were. There were only a few stalls but they certainly didn’t expect anything to kick out the walls as the boards were extremely thick. We walked across the road to the Caldwell Place. It’s old and completely devoid of furniture but still with a lot of character. The house was built in 1903 and took five years to build. Although the architecture is quite simple the finishing details were astonishing. There was a beautiful arch in between two of the rooms plus each window had lovely finishing. Although the house is lovely it is marred by the names of foolish people who for some inane reason have elected to put their name and/or status on the walls. I will never understand the desire to do that. Guess they either don’t know or don’t care that it’s also a federal offense but then I suppose there is little chance of being caught. Sad. We drove on down the road until we got to the end and along with others found a parking place to watch for the elk. We only waited about 15 minutes before I heard Jerry say “Elk, elk, elk”. One lone elk came casually walking across the lea. He looked like he was waiting for someone but apparently they were not coming because he remained alone. We could not tell if it was a male or female as it was far away and we certainly would not be approaching it. Jerry later said that it must have been a female because it was small. We waited a bit longer but didn’t see anymore and since it was nearly 7:00 and the park closes at sundown we headed out. It’s only a 10 mile ride out but certainly not a 10 minute ride. The speed limit in places is 5 mph – that should tell you something! I wish I could vividly describe some of the graveled roads that Jerry and I have been home, some mountainous and some downright scary. Jerry said as we were going up I was looking for elk and he was looking for a T-Rex! As we were leaving we had a young guy whose car looked like it was packed to go home from college ask if he could follow us out of the valley. I think he was just a little intimidated by the drive. We made it back to the RV and had a quick dinner. Previous postSoco Falls and Waterrock Knob in One Day!